If you follow this blog you'll know that I love elephants. This is the sweetest gesture. The Haiti situation was indeed hideous before the earthquake and is beyond disastrous at this point. My heart truly goes out to that country. I encourage everyone to please donate something. They needed it before....but now. I donated to the Red Cross using the text-messaging effort--it involves sending the word "Haiti" in a cellphone text message to the number 90999, which automatically adds a $10 pledge to a person's phone bill. The picture above is from TIME.com picture of the day, January 21, 2010. 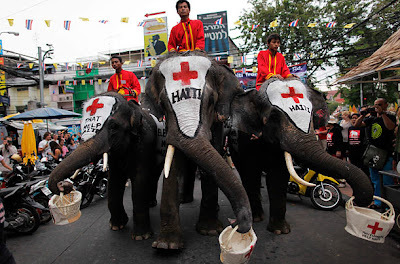 Thai elephants walk through the backpackers' area of Khao San Road to collect money for the survivors of Haiti's earthquake.